Just as fans are buzzing over the release of Jay Rock’s new single, “Hood Gone Love It“, it looks like the music video if not far behind. 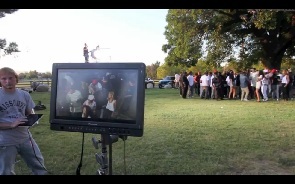 This exclusive behind the scenes video takes viewers on the set of Jay’s shoot for “Hood Gone Love It”. Shot in Jay’s neighborhood, the video is a classic West Coast throwback complete with barbecues and lowriders. Kendrick Lamar makes an appearance for his part in the song, and the entire ‘hood turns out to support Jay Rock’s Follow Me Home. Powered by J.U.S.T.I.C.E. League production, “Hood Gone Love It” has been gaining momentum as one of Jay’s best singles to date, and as the first official single for Follow Me Home, fans can only expect bigger things from Jay Rock. Stay tuned for updates on the official “Hood Gone Love It” music video.